MasterPieces: The Drums, The Drums, The Drums, The Never Ending Drumbeat.... | Warped Factor - Words in the Key of Geek. Chris Morley hears the sound of drums. We can all have a little sympathy for the Master when it comes to getting certain rhythms stuck in our heads, but where we can dismiss them as mere earworms his struggle with the repetitive drumbeat it would seem only he could hear meant something rather different. 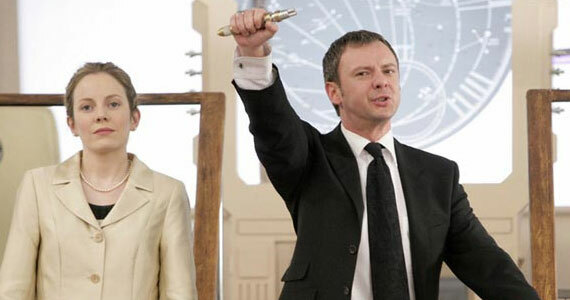 We know now that the rapid one-two-three-four was intended to mirror the standard Time Lord twin heartbeat. Could it have been the case that it was that he was attempting to flee as much as anything after a spell as a human, the reveal of his true self, regenerating, stealing the TARDIS & making his way to Earth? It's also mentioned among the multitude of voices Professor Yana hears upon finally giving in to curiosity & opening the fob watch he claims to have been found with as an orphaned child. The drumbeat itself of course compelling him to return to his Masterly self! Cue the moment of revelation. "The Professor was an invention: so perfect a disguise that I forgot who I am." "The drums, the drums, the drums, the never ending drumbeat. Open me, you human fool. Open the light and summon me and receive my majesty." In among the other samples used you can hear Roger Delgado attempting to bargain with Azal in The Daemons & a laugh from Anthony Ainley. And what does he do soon after taking office? Tap out that same rhythm on a desk, as many a bored employee will surely have done in the past! DUMFRIES: Excuse me, Prime Minister. Do you mind my asking, what is that? MASTER: It's a gas mask. DUMFRIES: I beg your pardon? DUMFRIES: Yes, but, er, why are you wearing it? MASTER: Well, because of the gas. MASTER: Because of the gas. Where there are drums, he later decides there must be dancing. Enter Rogue Traders. So here it comes, the sound of drums! Yet another instance of the use of pre-existing pop music in the creation of New-Who's soundtracks, & among its most memorable as the Master gears up for a bit of a shimmy while the Toclafane prepare to dine out on the very people who voted him into power in the first place. Yum. "And so it came to pass that the human race fell, and the Earth was no more. And I looked down upon my new dominion as Master of all, and I thought it good." Was he truly master, though, or simply a slave to the rhythm? That would be answered by no less than Rassilon himself in a grand reveal. Come The End Of Time, the Master's latest plot is revealed to be no less than a sort of sound boost, his transformation of the peoples of the Earth he'd once asked to attend carefully into clones of himself allowing them too to experience the beat. Which in turn amplifies it to the extent that a signal can be sent to the Time Lords & allow Rassilon to lead them straight to him. "A drumbeat. A warrior's march." "Drums were the driving force behind the percussive din that characterized the ancient art of war. The goal was to energize your troops while terrifying your enemies with the thunderous noise you could make." Its retroactive use here does raise one rather large question, though. "The signal has been sent. A simple task of four beats transmitted back through time, and implanted in the Master's mind as a child." If indeed it has been there since he was that terrified young boy of eight, why had it never been mentioned in any of his past appearances? "Ever since I was a child... I looked into the Vortex and that's when it chose me. The Drumming. The Call. To War." Could it be a sort of post traumatic stress disorder manifesting itself in the man resurrected to fight in the Time War before deserting & finding Utopia courtesy of that fob watch & the handy ability to store his true self inside it? The big finale comes with the anguished repetition of the beat that started it all. "You did this to me! All of my life! You made me! One! Two! Three! Four!" Looking into it from a purely musical standpoint, it would appear that the drumming was, as he suspected, a call to arms. Even Shakespeare's Othello makes reference to the drum's military applications. Its appropriation into such duties, at least in the armies of Europe, is believed to date from the Crusades, the forces of the likes of Richard the Lionheart impressed by similar Saracen set-ups on the field of battle. The Master would of course take advantage of the absence of the real King John on such business in The King's Demons, a good few bodies before his the young & strong one seen opposite the Tenth Doctor. Whatever the face the Master is always striking a militant beat, you could say?